Imagine a world where personal and professional growth are combined, where improving your relationships and owning your strengths at work translate directly into the rest of your life. Creating a company culture like that is not a dream. Through personal stories and real-life conversations, Jonathan Raymond takes you into the room with managers and employees where real culture change happens, and shows you a new kind of employee mentoring where each person gets the real-time feedback, support, and clear boundaries we all need to get beyond the patterns that hold us back. In this provocative and timely new book, Jonathan brings together what he has learned over a twenty-year journey as an executive, entrepreneur, team leader, and leadership trainer. Combining his experience as the CEO and CBO of EMyth where he led the transformation of a global coaching brand with the lessons learned along his own personal growth journey, Jonathan walks us through a step-by-step approach that integrates the leading edges of both. You ll discover a way to lead your team that is both profoundly human and results-oriented at the same time. 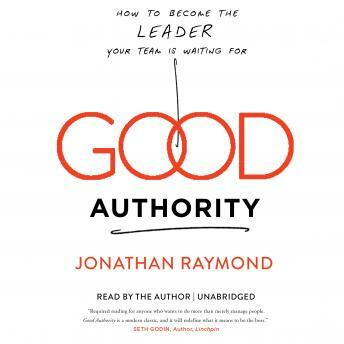 Whether you're a CEO or business owner, executive, team leader, consultant, or coach, Good Authority will give you new ideas and inspiration you can put into practice. Most importantly, it will give you permission to be more of who you are at work than you ever thought possible.